Report on the Empowerment/Distribution of items, Organized by Mothers Pride & Development Initiative, Ogun State, Nigeria. on 8th December 2017 at the Mowe Market town Hall Mowe Ogun State. The programme started at 10am with an opening prayer session led by Mrs kehinde Janet, followed by national Anthem. She stated that the organization has recorded over 250 participants and has empowered women and widows in the area of skill acquisition, computer training, bead making, make-up, catering etc. Other special guest that graze the occasion are delegate from the Ogun State government, such as the President for Ogun State Women Council in the person of Alhaja Aliyu, Alhaja Balogun , Mrs Omolokun. 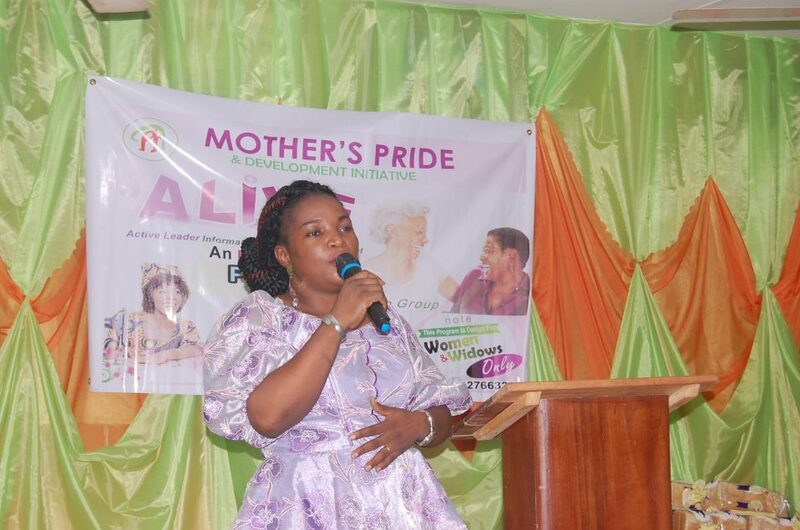 Others were Mrs Matilda Olatundun the guest Speaker for the event and Barr (Mrs) Maureen Opara. Other attendees include Otunba Dire Adeoye of City Magazine and Mr Olamilekan Daramola of Orisun Television and Mr Tope Alabi. The First Speaker, Mrs Matilda Olatundun a businesswoman, an entrepreneur and a philanthropist. She talks about how women can achieve so much in the recycling business. The era of over dependence on men is long gone and now women must rise up and be bold to face whatever challenges that come their way. She called on women to be more productive as there are many avenues from which one can tap resources from, She gave an instance of wealth generated from waste recycling which is the business she is into and has expressed her desire to train women of the organization in the recycling business in order to have them empowered and to contribute her own quota to the development of MPDI women. There was room for questions to ask which were answered in all, and she advise all beneficiary of revolving loan without interest to be faithful with the repayment, so it can go round. The Second Speaker, Barr. (Mrs)Maureen Opara, an erudite lawyer from the chambers of Ubberima Fidae Solicitors Lagos State, she spoke on gender equality and domestic violence on women. Mothers Pride and Development Initiative has initiated another arm to see to those that have related issues for advice and counseling. Mrs Olawope an attendee of the event gave instance of how she rose from her challenges of not been educated to now been an educated person as she was very zealous and determined to get education by all means. She encouraged women to brace up in all their circumstances and to believe in themselves. There is no need of losing hope after all. She said that the death of one’s spouse should not make one resort to prostitution or other social vices just to make ends meet. The Founder of Mothers’ Pride thanks all for their support and promised to achieve greater things in the years to come. She promised to work hand in hand with the Coordinators in various units within and outside Ogun State, so that all issues can be adequately handled and resolved where necessary. Cheques of loan without interest were given to three women, presented to the Beneficiaries by one the invited guest. In other to have a continuous cash flow in MPDI, the initiative lunches other new product (Mothers pride liquid soap, toilet wash, germicide, insecticide ). A total of 195 persons were in attendance made up largely of the womenfolk. The women came from all walks of life and even within and outside Ogun State. The event came to an end by 2.30 pm with the closing prayer led by Alhaja Balogun .